Multiple Grade I winner Mind Your Biscuits logged his final breeze on Friday prior to the Sept. 29, $200,000 Lukas Classic (Grade III) with a five-furlong move in 1:02 at Churchill Downs. With jockey Tyler Gaffalione aboard, Mind Your Biscuits worked at 5:45 a.m. through splits of :13.40, :25.80 and :38 prior to galloping out six furlongs in 1:15.40 and seven furlongs in 1:29.40, according to Churchill Downs clocker John Nichols. Gaffalione has the call on the 5-year-old son of Posse in the Lukas Classic, according to Summers. Summers has opted to stable Mind Your Biscuits for at least two months at Churchill Downs as the classy sprinter preps for the Breeders’ Cup on Nov. 3. Mind Your Biscuits is the richest New York-bred in history with $4,159,286. Owned in a seven-way partnership between Summers, Shadai Farm, J Stables, Head of Plains Partners, Scott Summers, Daniel Summers and Michael Kisber, the chestnut colt has a record of 23-7-10-3. Among the likely challengers to Mind Your Biscuits in the Lukas Classic is DARRS Inc.’s Stephen Foster Handicap (GI) runner-up and last year’s Lukas Classic winner Honorable Duty. The colt breezed five furlongs Friday in 1:00.60 with trainer Brendan Walsh aboard. Al Shaqab Racing’s 2014 Breeders’ Cup Classic (GI) runner-up Toast of New York also is an expected Lukas Classic entrant. The 7-year-old son of Thewayyouare is scheduled to arrive at Churchill Downs on Sunday morning from England where he will be quarantined for 42 hours. The four-time winner could be cleared for training on Tuesday, according to Director of the Stable Area Steve Hargrave. FOREGO STAKES WINNER WHITMORE PREPS FOR PHOENIX, BREEDERS’ CUP SPRINT – Robert LaPenta, Head of Plains Partners and Ron Moquett’s multiple graded stakes-winning sprinter Whitmore breezed a maintenance half-mile in :49.20 Friday morning at Churchill Downs as the chestnut gelding continues his preparation for Keeneland’s Oct. 6 Phoenix Stakes (GI) and the Nov. 3 Breeders’ Cup Sprint (GI) beneath the historic Twin Spires. 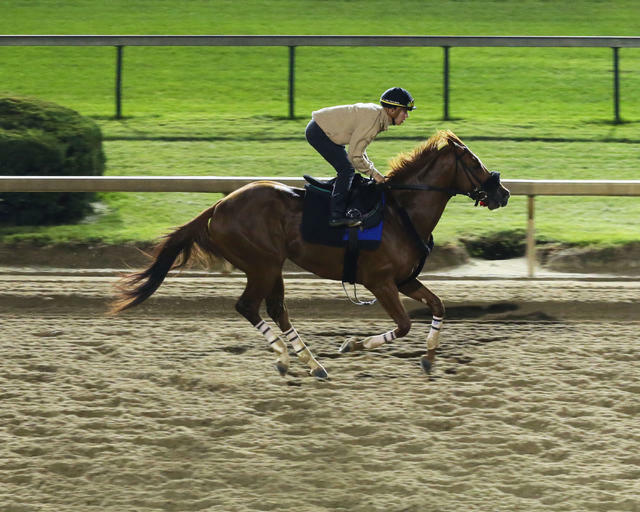 Whitmore, a 5-year-old son of Pleasantly Perfect, worked on the inside of stablemate Pryor in the first set of horses when the track opened at 5:30 a.m. ET. Most recently, Whitmore rallied from just off the pace to defeat seven rivals in the Aug. 25 Forego at Saratoga. The 11-time winner finished eighth in last year’s Breeders’ Cup Sprint at Del Mar. Probable (with trainer): Flowers for Lisa (Jorge Navarro); Honorable Duty (Brendan Walsh); Mind Your Biscuits (Chad Summers); Rated R Superstar (Kenny McPeek); Securitiz (Joe Sharp) and Toast of New York (Jamie Osborne). Probable (with trainer): Captivating Moon (Chris Block), Dubby Dubbie (Michelle Lovell), Real Story (Ignacio Correas IV) and Tigers Rule (Vickie Foley). Entries for Saturday’s card will be drawn Wednesday. EVERYONELOVESJIMMY SEEKS THIRD-CONSECUTIVE WIN IN SATURDAY’S DOGWOOD – Sierra Farm’s homebred Everyonelovesjimmy is looking for her third-straight victory as she tries stakes company for the first time in Saturday’s $100,000 Dogwood (Listed) at Churchill Downs. Trained by Ian Wilkes and ridden by his son-in-law Chris Landeros, Everyonelovesjimmy spurted clear to a nine-length win in her second-career start on March 25 at Gulfstream Park. The daughter of Jimmy Creed quickly moved up in class and defeated a first-level allowance field by 2 ¼ lengths on June 21 at Churchill Downs and a second-level allowance field by three-quarters of a length on Aug. 11 at Ellis Park. Everyonelovesjimmy (5-3-1-1—$107,530) has been based at the Skylight Training Facility located in Goshen, Ky. The seven-furlong Dogwood is carded as Race 10 on Saturday’s 11-race program with a post time of 5:26 p.m. (all times Eastern). First post gets underway at 12:45 p.m. The field for the Dogwood, in order of post position (with jockey, trainer and morning line odds): Figarella’s Queen (Shaun Bridgmohan, Brad Cox, 3-1); Divine Queen (Calvin Borel, Buff Bradley, 30-1); Shes Our Fastest (Jack Gilligan, Scott Gelner, 10-1); Jean Elizabeth (James Graham, Larry Rivelli, 5-1); Miss Mimosa (Ricardo Santana Jr., Bill Mott, 8-1); Devine Mischief (Adam Beschizza, Joe Sharp, 4-1); Everyonelovesjimmy (Landeros, Wilkes, 6-1); Salt Bae (Julien Leparoux, Bernie Flint, 12-1); Primo Extremo (Walter De La Cruz, Jason DaCosta, 15-1); Naples Legacy (Gabriel Saez, Mike Maker, 30-1) and Go Google Yourself (Brian Hernandez Jr., Paul McGee, 5-1). All horses will carry 118 pounds except Figarella’s Queen who will tote 120. ‘INSIDE CHURCHILL DOWNS’ FEATURES TRAINERS BRAD COX, BUFF BRADLEY FRIDAY NIGHT – “Inside Churchill Downs” airs Friday at 6 p.m. on ESPN Louisville’s ESPN 680/105.7 and features trainers Brad Cox and Buff Bradley along with TwinSpires.com handicapper Ed DeRosa. Those outside the Louisville radio market can listen live online at www.espnlouisville.com. DOWN THE STRETCH – Friday’s 10-race program gets underway at 12:45 p.m. with a 20-cent Single 6 Jackpot carryover of $15,191 in Race 5 at 2:45 p.m. and a Super Hi 5 carryover of $2,686 in Race 10 at 5:26 p.m. … Bring the family to Sunday’s “Be Creative” Family Adventure Day presented by Kroger for an affordable day of fun and horseracing for the whole family. Churchill Downs’ partners will be on site to keep the kids entertained all day with a range of fascinating arts, crafts and science activities. Tickets start at $8 and can be purchased on www.churchilldowns.com. … Jockey Joe Rocco Jr. will serve a three-day suspension beginning Sunday due to a disqualification at Kentucky Downs. … Trainer Dale Romans reported top sprinter Promises Fulfilled will have one prep race in the Oct. 6 Phoenix (GII) at Keeneland prior to running in the Nov. 3 Breeders’ Cup Sprint (GI) or Breeders’ Cup Dirt Mile (GI) at Churchill Downs. … Defending Woodford Stakes (GII) winner Bucchero is scheduled to breeze Sunday at Churchill Downs as he prepares for the Breeders’ Cup Turf Sprint (GI), according to trainer Tim Glyshaw. … Locally-based jockey Declan Cannon will not ride Sunday at Churchill Downs because he is getting married to his fiancée Lauren Wilkinson in Lexington.